Welcome to Active4Signage, the home of Active Visual Supplies’ Digital Displays, Touchscreen Displays, Digital Signage and Digital Poster solutions. Applications include leisure, retail, commerce, schools & colleges, hospitals, restaurants, exhibitions, museums, theatres, cinemas and more. Please see our What is Digital Signage and Typical Applications pages for more information. On this website you will find screens and displays to showcase your digital signage and software to create & manage the content. 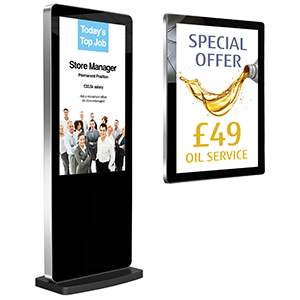 Display screens can be as simple as a counter-top or wall mounted display, through freestanding displays, to outdoor displays and video walls. Need interactivity? Add touchscreen capabilities (available on many of our freestanding and wall-mounted screens) and allow your customers to explore further at their own pace. So whether it’s a welcome message or a new product launch, a timetable or a menu, a competition or a special offer, we have a solution to suit. To learn how we can help your display & signage needs, please contact the Active4Signage sales team today.